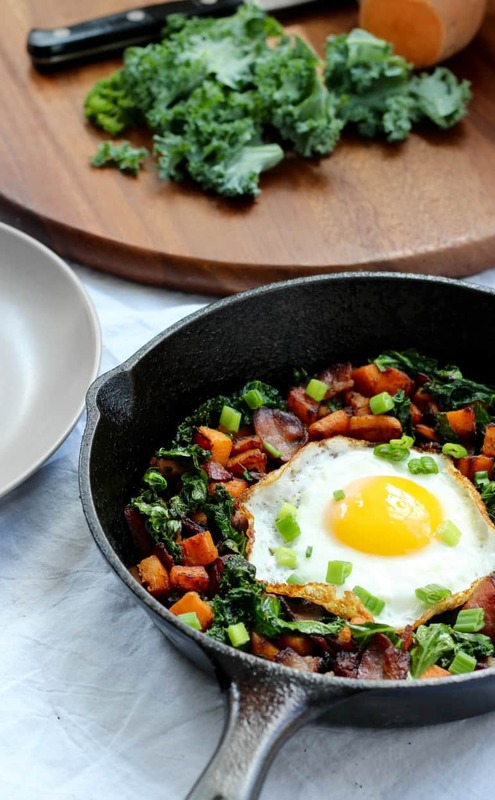 A single serve Sweet Potato Bacon Kale Hash that’s healthy, satisfying, and made in one skillet! Have it with fried eggs for breakfast or comfort food any time of day – it’s grain free, dairy free, Paleo, and Whole30 friendly. When I realize I’ve been eating the same meal over, and over, and over and I just can’t seem to get enough – it must become an official recipe. Yup, that’s what happened here. 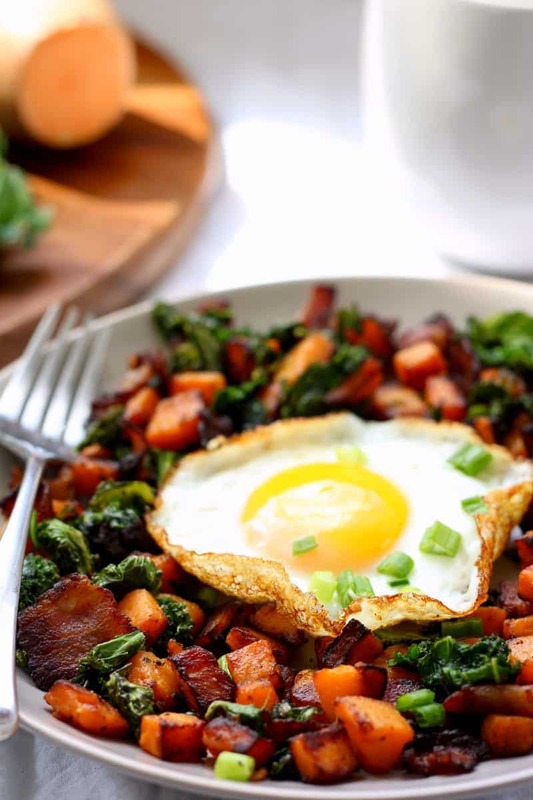 I actually searched my blog, figuring I had to have shared this recipe before at some point (and trust me there are similar ones to be found – see plantain bacon kale hash and sausage sweet potato hash) but I’ve never shared this one – a single serve, a smoky sweet potato hash with crispy bacon, crispy kale and a fried egg. 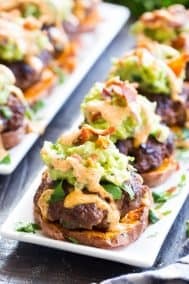 Single serve Paleo perfection, if you ask me! 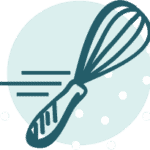 I would say most of the recipes on this blog can be divided into 2 categories: 1.) Those which I eat all the time and 2.) Those that I wish someone would make for me so I could eat them all the time. To translate, some are more time consuming, more difficult, and I am typically too lazy or busy to cook them. The other ones are SO easy that I cook them all the time, for more of my meals than I might ever admit. 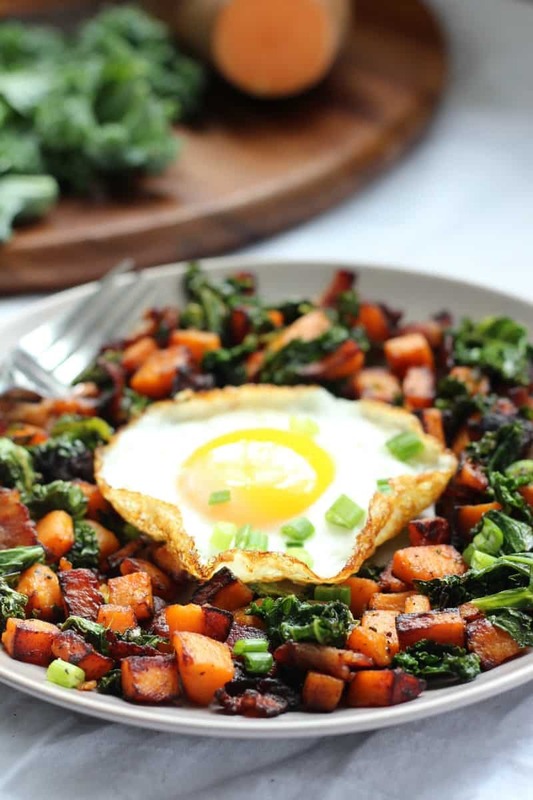 The thing (or at least one thing) that’s so great about this sweet potato bacon kale hash is that you basically just put the ingredients in the pan, stir, cover, stir again, cover, fry an egg if you wish, and then it’s done. I’m asked sometimes in real life how I manage to cook myself a big breakfast in the morning while dealing with the kids’ morning routine and making food for them. The answer is really that I’ve figured out breakfast recipes that don’t require all my focus so I can do other things in the kitchen while I’m cooking. Like pouring milk into cereal, peeling bananas, and frying up my daughter Diana’s beloved plantains with eggs. And of course, making coffee. Once you get the hang of it, this breakfast is easy enough to make while also making coffee and giving into your kids’ 20 demands per minute. Have I sold you yet? I mean on the kids, not the recipe. 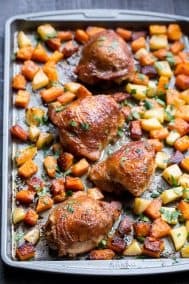 I still have more to say about this recipe if you can believe it – I told you it’s one of my favorites! In case you happen to be a runner, I will tell you that this is one of the most perfect post-run meals, um, ever. Epically after a long run! 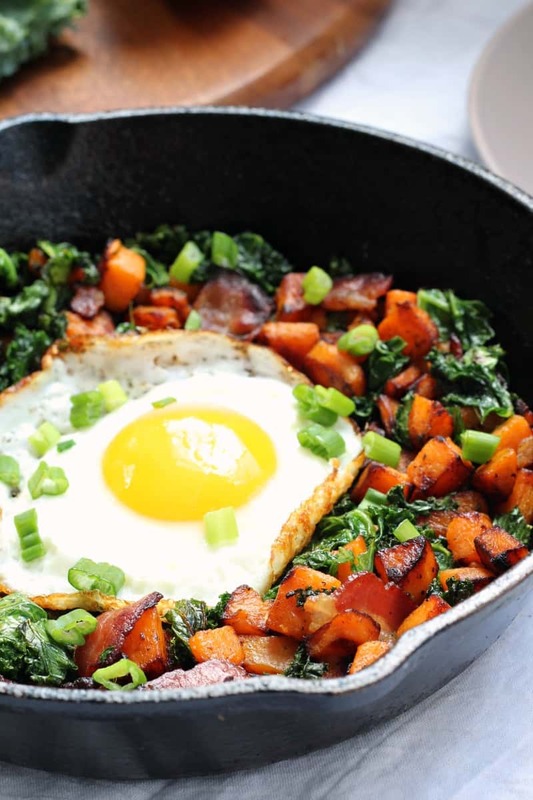 You get plenty of fat from bacon, carbs from sweet potatoes, kale because we are being healthy here (and it’s so, so good and crispy with bacon!) and salt. We runner love and need our salt! Plus, just because I put an egg on it, does not mean this is just for breakfast. 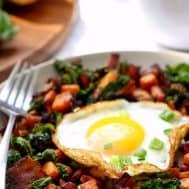 Any time you need a good single serve easy meal, this Sweet Potato Bacon Kale Hash will be your best friend. 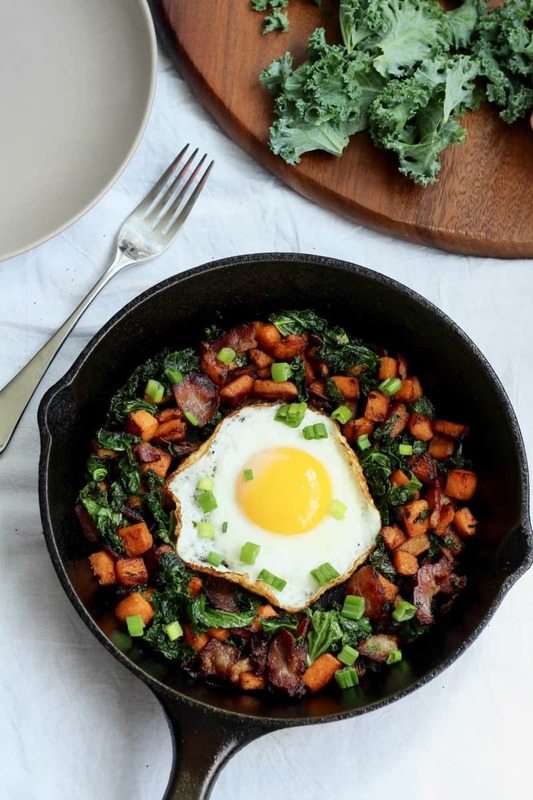 A single serve Sweet Potato Bacon Kale Hash that's healthy, satisfying, and made in one skillet! Have it with fried eggs for breakfast or comfort food any time of day - it's grain free, dairy free, Paleo, and Whole30 friendly. Heat well seasoned cast iron skillet(or other non-stick heavy skillet) over medium heat, and add the bacon pieces. Cook for about one-two minutes covered, then uncover and stir to prevent burning. Adjust the heat if necessary, then cover again and cook until the bacon and potatoes are browning and the potatoes are getting soft. 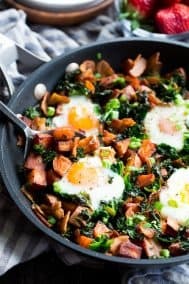 Uncover the skillet and add the chopped kale, stir to coat the kale with bacon fat, add a pinch of salt then recover to allow the kale to cook. While the hash is cooking, you can fry or scramble your egg in a separate pan to serve alongside the hash. You can use rendered bacon fat for this or another cooking fat of choice. Once the bacon, potatoes and kale are cooked to preference, stir once again and then transfer to a plate to serve! Top with your cooked egg and garnish with green onion and additional salt and pepper if desired for a final touch Enjoy! 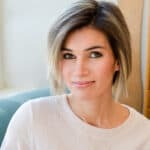 ***U.S. Wellness Meats sugar free pork bacon is seriously incredible and has been my favorite Whole30 go-to bacon for years! Do you secretly (or not) have a meal that’s too good not to eat every damn day? What does your morning breakfast routine look like? Runners – all time favorite post-long run meal? My portions change a bit but I still want the same stuff when not running. Or, maybe we’ll see after the marathon. I don’t eat bacon but I just may have to buy some so I can try this! WHAT?! Well i say we should have a bacon party to get you started. Right michelle? LOL! kidding, kinda. But a hash party in a must. I’m a crazy person who doesn’t love bacon but I’ve literally been making a breakfast like this for months! I started my blog on an all-oatmeal-for-breakfast kick and now I’m on (and loving) savory. If it was post-long run I would probably eat a larger than normal sweet potato with my meal, but the rest looks like this! Looks amazing for post run especially because I need to not be attending to cooking my food for too long after my shower…I’m not hungry for those shower minutes, but suddenly the runger strikes and anything complicated is too difficult. Hence my pretty much all the time omelets and scrambles! I hear you! Lately I’ve been eating before I even shower. Kind of gross but I’m lazy about showering! Love all your skillet breakfasts! My fav breakfast is a sweet potato stuffed with sautéed kale and a fried egg. 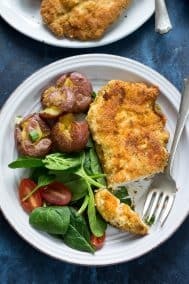 This one skillet meal combines those flavors, but looks even easier. Delish! That sounds so amazing! I need to actually bake a potato to stuff it once in a while! It definitely is so Paleo, which is why I love Paleo, ha! I haven’t made pancakes in so long, must take your lead! I also don’t eat a ton of bacon, but I’m happy to make an exception once in a while! 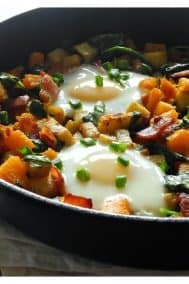 : ) Have you ever tried adding nuts to a breakfast hash? I’m imagining a salty, crunchy nut like pine nuts could also add a lot of texture and flavor, but I’m curious to see if anyone else has tried it. My breakfast every single morning for a while now has been Cheerios. I cut them out for a long time thinking the oats would bother my tummy, and now that I’ve added them back in, I can’t. get. enough. Yay boring American breakfast staple! I am not a huge nut lover (although nut flours are an exception!) but I’d say it’s worth a shot! I’ve made roasted candied sweet potatoes with pecans which is really great so I think a hash would work, especially if you toast the nuts separately and then add them in. This is so tasty! My neighbor just brought over some fresh kale so I got on pinterest to find a way to cook some of it up. 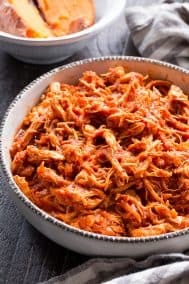 I found your recipe and it didn’t disappoint!! I will definitely be making this again soon. Yay! So glad to hear. One of my favorite breakfasts! This looks great! I’m not a huge fan of kale, though, so I’m wondering if spinach would be an acceptable substitute? Also, I had major issues with eating fried eggs when I was little, but I’m toying with the idea of trying it again now that I’m all grown up. It definitely looks like it could be tasty on this hash! Spinach would be great, it wouldn’t be crispy but that’s obviously fine if you like it. It would barely take time to cook so you would add it last minute or omit the water. I also sometimes just leave the greens out of the pan and then put the cooked hash over fresh baby spinach! I am brand new to your site. And I could not have started with a better recipe. This dish is soooooooooo good. I made this two days ago and have been dreaming about it ever since. 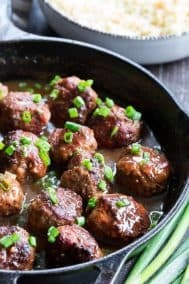 Great healthy, easy and delicious recipe! I will definitely be trying more! This was delicious. 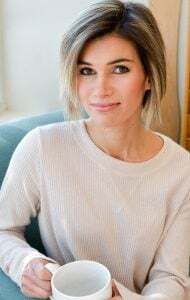 While I love bacon, my stomach doesn’t love greasy foods – paleo or otherwise. I baked the bacon in the oven, and cooked the potatoes and kale in the skillet with a tiny bit of bacon fat. I added the bacon last minute, once it was crisp, and used plenty of smoked paprika and cayenne for some kick. Topped it with an over easy egg. Thanks for the inspiration! Hey! This is my first time here. How many calories are in this dish? I can’t wait to try this out! 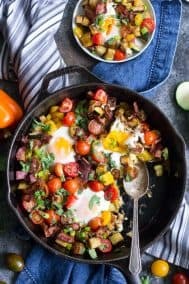 I decided to incorporate more Whole 30 recipes into my meal rotation, and I am OBSESSED with this for breakfast! I don’t even add the egg on top and it’s still really filling. This is the one I make the most for myself I think! Never disappoints. So happy you like it too! I made this today & its soooo yummy!! How well does it save to be reheated another day? This one saves pretty well if you reheat it in the oven to crisp up again 🙂 Glad you liked it! I’ve done something similar for years. I also add chopped tomato and avocado after I take it off the stove. Sooooo good. I made this once from this recipe and have been eating it once a week ever since. It is easy to cook alongside being cheap and delicious. Thank you! Ok I like the ingredients but I have a problem with all that kale. After the handful what do I do with the rest? I don’t like it enough to use in salads. In my search for recipes for one, ingredients that are only partly used and need storage seem to be my biggest problem.